This weekend our good friends came down to visit us from Oshkosh, and we had a good time despite all of the gloomy weather. They got the tour of the ever-so-exciting cities of DeKalb and Sycamore. Jacki is a fellow knitter, and so a stop at the Yarn Exchange was mandatory. Good thing both of our husbands have a lot of patience for these things. 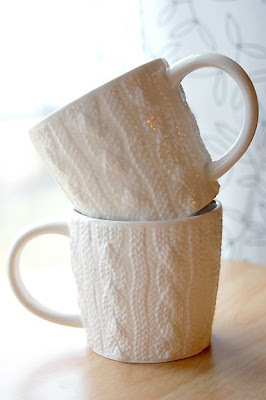 :) They know me way too well, they brought some knitted mugs for me! I LOVE them!! Jealous? 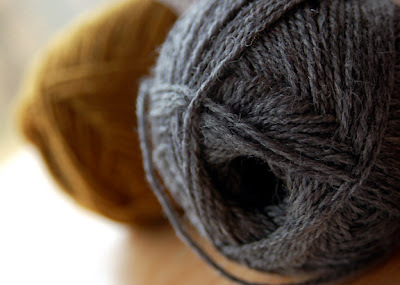 I also bought two skeins of yarn- Brown Sheep Nature Spun sport weight. I am thinking fingerless gloves. They also fit the color scheme of my life. Ochre yellow and gray. It was the same colors outside yesterday. The sky was grey and the hay field behind my house was matted down and yellow. I took it very easy yesterday, It was the start of my spring break this weekend, so I've been trying to recouperate from the first half of the semester a little bit. I finished the body of my Francis Sweater yesterday as well, but I am thinking I may go back and add about an inch more of seed stitch to the bottom. I've already added about 3" total to the length, and it just needs a smidgen more. The body fits perfectly though, and I LOVE the color. Thats it for now -- I'm off to start cooking some portabella burgers! 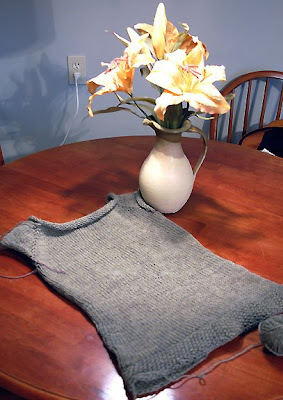 I found your blog from the Rav topic on knitting bloggers. Love your stuff and look forward to seeing more of your great photos in the future. Looking forward to seeing the adequately-reproportioned Francis!